That Luke Rockhold (pictured) is so dreamy. Alright, ladies. We get it. The former Strikeforce middleweight champion is MMA’s version of Tom Ngo – I mean, Brad Pitt. However, if you’re able to see past Rockhold’s good looks you’ll quickly realize that he’s a very good fighter. Just ask Tim Boetsch, he’ll tell ya. It took Rockhold all of 128 seconds to submit “The Barbarian” with a kimura on Saturday night. To reward himself for a job well done, Rockhold mowed down several bags of potato chips at the post-fight press conference. 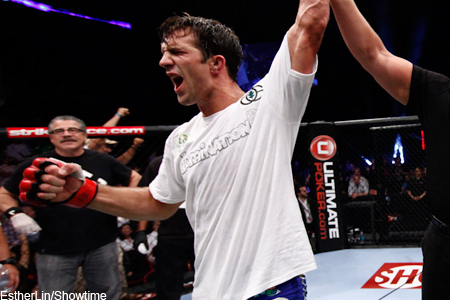 Following his latest victory, Rockhold called for a rematch against Vitor Belfort. If not, he said he has “personal business” with Michael Bisping. Then again, what middleweight doesn’t call out Bisping?